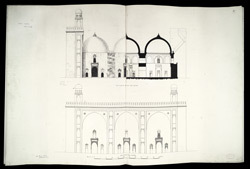 Illustration of half elevation and half long section (top) and elevation of front restored (bottom) from the Alif Khan mosque at Dholka from James Burgess' 'Original Drawings [of] Muhammadan Architecture in Gujarat. 'The Alif Khan mosque, also referred to as Alkif Khan Bhukai or Khan-ki masjid, is a massive brick building, dating from the period of Sultan Mahmud Begada (r.1459-1511) and constructed by Alif Khan Bhukai, a childhood friend of Mahmud Begada. The original structure consisted of two square solid minarets, one on each end of the façade. The mosque's interior consists of three square halls, each enclosed with a massive dome. The interior measures 150 by 42 feet. The central mihrab, or prayer niche, is found along the back wall of the centre room, flanked by two windows decorated with perforated stone tracery.